In the endangered ocelot’s struggle for survival, the little cat’s best friend may be Hilary Swarts ’94. SURVIVAL CAN BE A REAL CAT FIGHT when you get squeezed out of your rightful home. When your food supply dwindles. When you are small and cute and easy to run down. Even though you are standoffish and try to keep to yourself. In 22 countries, from Uruguay to south Texas, the ocelot (Leopardus pardalis), one of smallest and most secretive of all wild cat species, is facing this sad plight. Its habitat—thorn scrub, coastal marshes, tropical and pine-oak forests—has shrunk alarmingly, swaths destroyed by building and farming and other human activity. With diminished space in which to establish territories, find secure denning sites and forage for rodents, birds, snakes, lizards and other prey—plus the increased threat of becoming road kill as highway construction boomed in the 20th century—the ocelot has been in the fight of its life. Back in the 1960s and early ’70s, ocelots were nearly loved to death. Laws then did not prohibit taking them for exotic pets or hunting them for their beautiful, dramatically marked fur. Babou, Salvador Dali’s frequent sidekick, may have been the most famous of captive ocelots. In the U.S., as the wild population of these little cats became depleted under development pressures, the fashion industry turned to import, reaching a peak of 140,000 pelts from Central and South American countries in 1970. Toward the end of the century, all these human endeavors had chipped away at the historic U.S. ocelot range—which once stretched from Louisiana to Arizona—cornering the few known remaining individuals in the Lower Rio Grande Valley, where Texas meets the Mexican border and the Gulf of Mexico. Wildlife biologists, scientists, researchers, conservationists and other experts started running the numbers and saw that time was running out. Now, even after several decades of legal protection and some active conservation projects, only 55 or so known individual ocelots remain in the U.S. 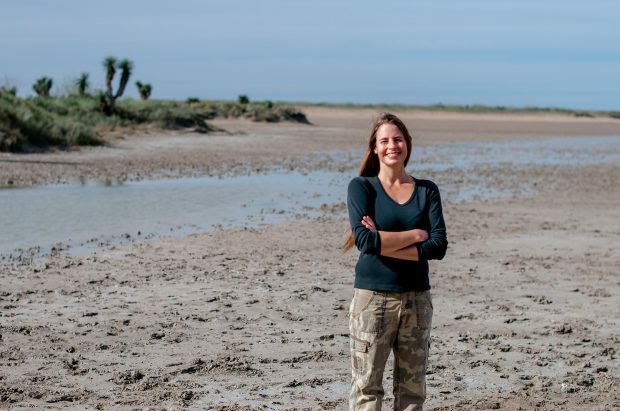 There are few rays of sunshine in this grim picture, but one of the brightest landed at Laguna Atascosa National Wildlife Refuge a little over three years ago in the form of wildlife biologist Hilary Swarts ’94. 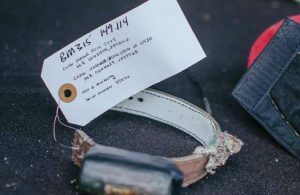 Radio-collars are attached with breakable string. This one was dropped by a male bobcat. Swarts listens to the signal from a radio-collar. In her senior year, Swarts threw herself straight into fieldwork, flying to Tanzania to spend her study-abroad semester in a wildlife conservation program there. However, midway through the semester, her plan to be immersed in chimpanzee communities took a bad turn: “I broke my ankle, had surgery in Nairobi [Kenya] and spent four weeks at Lake Manyara National Park designing exhibits for the Arusha Natural History Museum.” Instead of taking a planned hike up Mt. Kilimanjaro, she hobbled around on crutches for the rest of her stay. If she had to pick a favorite, she says, it would be the time she spent in Suriname, monitoring a troop of capuchin and squirrel monkeys. “I lived in a hut with no electricity. The wildlife was mind-blowing. You’d stand still for five minutes, and all around you would come alive. Life was work and reading books and planning what to have for dinner and socializing with the locals.” She built up her explorer skill set by wielding a machete to cut trails and map sections of unexplored rain forest. 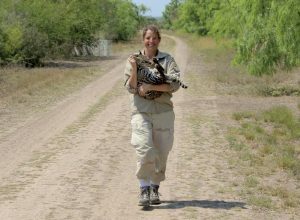 So, when a job opening in the wilds of south Texas popped up in her email for a wildlife biologist charged with leading the hands-on effort to save the ocelot in the U.S., she leapt at the challenge. THE LAGUNA ATASCOSA National Wildlife Refuge is a flat, sunbaked remnant of coastal prairie mixed with thorn bush, bordering on a vast hypersaline lagoon across from South Padre Island. Its dense thicket of low scrub is home to—at last count—15 of the remaining ocelots still living in the U.S., and for Swarts, it’s where the fight to save them from extinction is being waged. Meeting with her here can feel like a bracing seminar in All Things Ocelot. 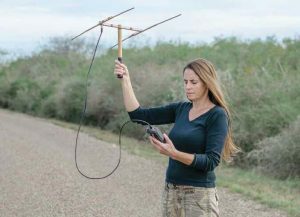 For starters, she’ll whip her refuge pickup into her driveway (on Ocelot Road, of course) and say, pointing at the license plate  on her 2000 Buick LeSabre, “Look!” The plate says “OCELOT” (of course), and the vanity fee collected by the State of Texas goes to Friends of Laguna Atascosa for outreach programs. 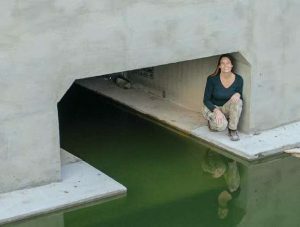 Swarts visits a wildlife underpass under construction. Though currently flooded, it will be dry when complete. 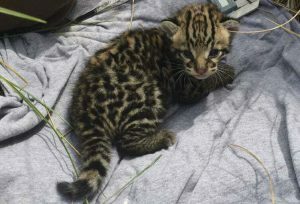 The first confirmed ocelot kitten at the refuge in 20 years. Working with ocelots, because they stay so well hidden, is different from her previous fieldwork, when she could watch the animals she was studying in their own environment (such as following gorillas around as they nosed about on their daily routines, which she describes as “total soap opera”). In fact, the only time Swarts and her small staff of interns actually see ocelots in the flesh is during trapping season, from October to May, when the little cats are lured by caged pigeons posing as an easy meal, then sedated long enough for blood and genetic samples to be taken. After a quick exam and insertion of a microchip, they are photographed, fitted with a GPS collar, given reversal drugs and released. “With the ocelots, I’m essentially doing detective work,” she explains. Across the refuge, there are more than 50 cameras tucked into the thorn scrub, monitoring animal activity night and day. Using cameras and GPS collars may not be as immediately satisfying as shadowing gorillas, but it’s the only way she can keep tabs on the elusive little creatures she’s trying to save. For instance, last year, on March 25, 2016, a heavily pregnant female was captured for routine data collection and then released. On the following two days, GPS signals from her collar indicated that she was staying put, likely in a den. After a few weeks, GPS showed more activity—she was almost certainly leaving the den for water, repeat behavior that is usual for a lactating female. “On April 15, when we knew she was away and couldn’t detect us, we found the little kitten, tucked under some Spartina. A male, healthy, weighing less than a pound, with his eyes just opened.” Swarts, who took hair samples, DNA swabs and his baby picture (below), was ecstatic to document and report this first confirmed ocelot den at the refuge in 20 years. “From my perspective they are doing their job—reproducing,” she says. “And ecologically we are in great shape.” However, she has grave concerns that the confirmed refuge population of 15, including kittens, may be approaching capacity. Home range for a female varies from one to nine square miles, depending on the availability of water and prey. For a male, figure four to 25 square miles. That brings us to exhibit one for the three top threats to survival of the species—habitat loss. Hemmed in by agriculture, highways and industry, the refuge itself can’t be greatly expanded. The other Texas ocelots, about 40 individuals, live on limited private lands in neighboring Willacy County, with no safe passage connecting the populations. And that leads directly to the second threat—vehicular mortality, which stands at an astounding 40 percent. 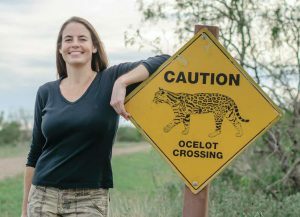 Swarts cites the ugly statistics that piled up between June 2015 and April 2016, when seven ocelots, including six males, were killed by vehicles on roads adjacent to fragile ocelot territory. Which brings us to the third item on Swarts’ list of top threats to the ocelot’s long-term survival: in-breeding, which occurs when populations are so isolated that no new genes can get into the mix. Even before her arrival in Texas, efforts to freshen the gene pool by bringing in a female ocelot from Tamaulipas, Mexico, had started and stopped several times, partly due to cartel violence. Still, she remains optimistic that, with research and negotiation, a female from Mexico will eventually be allowed to cross the border. Best of all, there are the little discoveries, the aha moments that move her work forward. That den discovered in April? “It was a surprise to find it in an open area, not in super dense brush,” she explains. It’s new ocelot information, the kind that can drive new policy and practice. In this case, it may lead to a new prescribed burn protocol designed to leave a protective margin outside the brush.